Can you imagine a man cave bathroom? 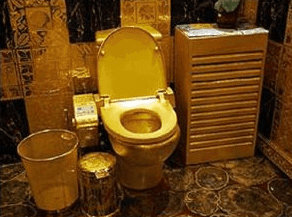 When I think of a man cave bathroom, I think of a gold plated throne with a diamond encrusted toilet handle. And flat screen televisions built into the mirrors. Below we take a look at a few interesting and unique bathrooms. You can spruce up your throne by making it just that. Why not install a gold plated throne! 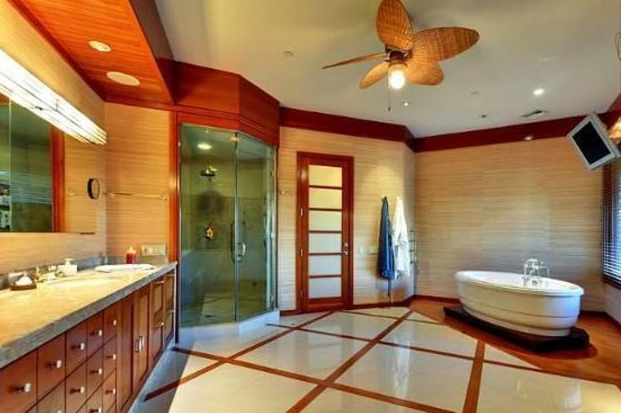 Just look at the Russell Simmons’ bathroom with a Midas touch. Imagine sitting on a golden toilet while watching the final two minute drive of the football game. Could life get any better? Only if the flat screen television was gold plated, which I wouldn’t be too surprised if it were. Speaking of celebrities, check out the bathrooms of ten of the rich and famous for some inspiration in your own home. The eighth bathroom shown houses Phillipe’s commode. As you can see, he has an elegant soaking tub. It is noted that he also has shoji screen doors, glass cloth wallpaper but most importantly he has what man caves everywhere need: a television. The true man cave must be an extenuation of the man’s actual entertainment center. Just because you have to use the men’s room does not mean that you have to miss the game! Follow Ryan’s lead and establish your bathroom’s connectivity to the Internet and television. It is possible to re-invent your existing bathroom to make it at least somewhat resemble a modern day man cave oriented bathroom. Take a look at the renovation process of this older bathroom. You can transform a boring and outdated bathroom into something that jives with the style of your man cave even if you are merely installing a stand up urinal, windows and a bed-board as pictured in the article. 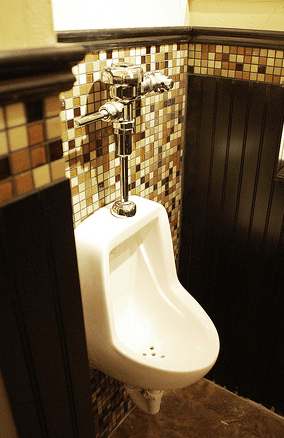 The standup urinal is quite the bathroom luxury and makes a simple bathroom feel more manly. Why not keep an eye on your favorite sports teams while doing your bathroom duty? It is the ideal way to relieve one’s self. The bathroom in the Breidenbacher Hof hotel in Dusseldorf, Germany allows you to keep an eye on sports scores. The hotel’s bathroom mirrors have televisions embedded in them! This is a sports fan’s dream! Why go to the sports bar to see the game when you can enjoy the competition in peace while relaxing in your bathroom? There’s not much more of a unique and relaxing way to watch a sporting event. Televisions embedded in the bathroom mirrors do come at a cost. The Briedenbacher Hof will set you back about $400 per night, which is a bit pricey to watch a game from a tub – but whatever floats your boat, or in this case – rubber ducky. Finally, we take a peak at the bathroom of popular rapper. Drake has gone all out with a flat screen television installed inside of his bathroom’s walk-in shower. At first glance, Drake’s shower set up appears to be remarkably luxurious. 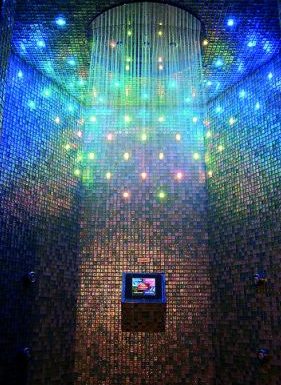 His television screen is waterproofed and stationed beneath a sequence of colorful lights. Can you imagine watching the day’s sports action while enjoying a hot shower? Now that is what I call a man cave bathroom. It’s hard to believe that man cave bathrooms are already reaching a mainstream tipping point. Yet we are nearly there. If you’ve got the money to spare then a man cave bathroom may be just what you need to find that extra bit of happiness. After all, every man cave does in fact need a bathroom, whether it’s to keep up on sports or marathon through a series on Netflix. Our bathrooms are becoming more connected and man cave bathrooms are on the forefront of making sure these rooms have the speed and power they need to keep up with the modern man.